Article written by Gemma Wellings, a twenty year old student studying fulltime in Bournemouth University. Gemma posts regularly on her Instagram page about positive ways to overcome social anxiety during her day to day life, addressing her struggles and how she can thereafter overcome them. She also posts regularly on her website about her mental health. Gemma is a full-time college student who managed to overcome her anxiety. Being a student isn’t always about drinking, going out with friends and studying five days a week. Between all of the student life chaos, it can get pretty lonely. 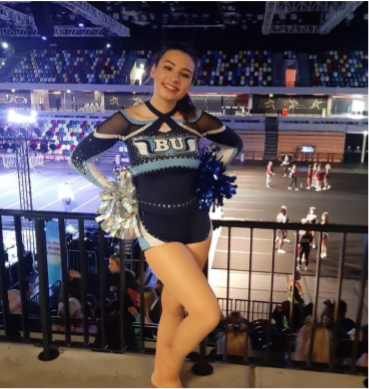 I joined the university’s cheerleading society hoping it would bring me a lot of friends, especially people with whom I share the same interests. Sadly, due to being so anxious about meeting people and constantly thinking about the “what ifs”, this became more difficult than I had ever anticipated. My mind somehow worried about the rejection I would face if I got up to speak and everyone turned their backs on me. Not that that has ever happened, but knowing that its possible and knowing how crushed I would be if that ever did happen was enough for me to stay away and seclude myself. The following steps are how I learned to handle my social anxiety. When I felt alone, the last thing I wanted to do was to burden people with my problems. Don’t get me wrong, you should definitely talk about how you are feeling to people close to you, but if you’re anything like me, you may prefer to keep it to yourself. This is why I originally set up my Instagram page. My page was a way to escape from anybody I knew and to anonymously post about how I was feeling and to get all my emotions out. It is always reassuring knowing that you are not the only person experiencing these feelings. It is also a great way to reflect on your day and to notice any reoccurrences which may be contributing to your issues. My mind often works non-stop, on overdrive. I would worry and question just about everything under the sun. ‘What if people judge me’ and ‘what if I end up standing alone’ were only some of the seemingly endless thoughts which would prevent me from leaving my house. I was blind to how toxic these thoughts actually were. Now, I realise I would’ve ended up isolated if I had stuck to that thought process. In my experience, fighting these negative thoughts was the hardest yet best lessen I’ve learnt thus far. Gradually, I learned to flip these thoughts to ‘what if I made friends’ and ‘what if I actually have a good time’. These thoughts of positivity really changed my mindset. They not only made me more relaxed and comfortable but they made me more approachable and confident. I found myself not overthinking what I was about to say or do, but thinking of the positive outcomes which would make the whole experience worthwhile. This is the most vital step in dealing with anxiety and indeed social anxiety. If you are going to take anything away from this blog post then let it be this; learn to love yourself. How are you ever going to be confident and comfortable around everyone else if you aren’t confident in yourself? Learn to say no to things you don’t want to do; put yourself first and enjoy your own company. Even simple things like going out for a walk and trying to really notice how beautiful the nature is around you. Find pleasure in the little things. I saw all these posts from friends of their HUGE friend groups, their perfect relationships and their perfect selves. The reality is that this is not always the case, people post what they want you to see, they don’t post their struggles or even their natural beauty. A lot of the time, these online photos are edited to make said individuals look and feel better about themselves; forced by a world so heavily based around social media. This is a harsh truth, not everybody is going to be your cup of tea, nor will you be theirs. This is life and that’s okay too. Don’t beat yourself up about someone who isn’t talking to you as much as you would like or if they’re rude to you. It’s easy to hide away in your shell when you’ve had a bad experience with an individual or a group but these downfalls actually make us stronger. It teaches us who we are as people and helps us to understand the type of people we want to be around and who we are happy to be around. I have recently started attending counselling. Originally, I shuddered at the thought of speaking to a stranger about my dark thoughts and emotions. I got used to going and realised that they aren’t there to judge me. Instead, they were there to make me feel better and develop positively as a person. I can only judge from my experiences, attending counselling helped me make sense of my emotions and where they stem from. For example, I attended an all girls secondary school and didn’t get along with lots of the girls. I then made the decision to move to a mixed school where I got on much better with the boys. My counselor pointed out that perhaps I had difficulty socialising with the cheerleading society due to my bad experiences with girl groups. It’s reassuring to know where your problems may have originated from, therefore makes them easier to solve. These are just a few ideas on how to deal with social anxiety from my perspective, I hope they help. Taking one step at a time makes a huge difference in the long run. This entry was posted in Creative Writing, Keep learning, mental health, self help, Self-care, Take notice and tagged anxiety, le cheile, lmha, mental health, self help, self-care, take time for yourself by Shauna Power. Bookmark the permalink.